First stage of bee removal done. 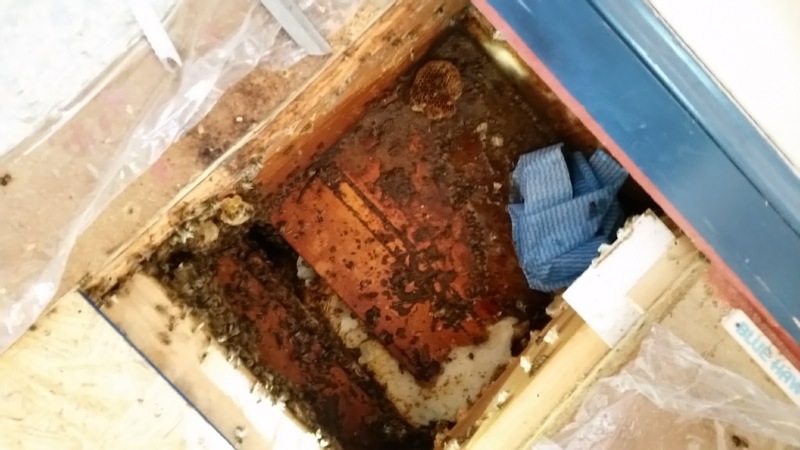 Today we removed a hive from between the 2nd story floor and dining room ceiling of a house. The picture to the left shows the first 9-inch deep cavity after we had removed the comb. The bottom left corner shows more comb peeking out from under the other section of plywood. Why two sections of plywood, you may ask! Well, we’re not the first to pull bees out from this floor. The bees were getting into the soffit by crawling up the mortar joints between the brick siding and then crawling through that big gap between the joists. The previous beekeeper sprayed foam insulation into the gap to keep the bees out, but the bees ate it! I guess once wood smells like wax, propolis, and brood, bees will eat just about anything to get back home. That one section contained about 40 pounds of honey. We ended up (successfully) using the bee vac to get most of the bees out — and we had to empty the bee vac twice. We banded what brood there was into empty frames and put those in a NUC with bees. We dropped the honey into a clean plastic container to process later. We put some of the empty comb in with bees in another NUC, just so they’d have the smell of home with them. Both NUCs are now full of confused bees in our yard awaiting a trip to the farm. 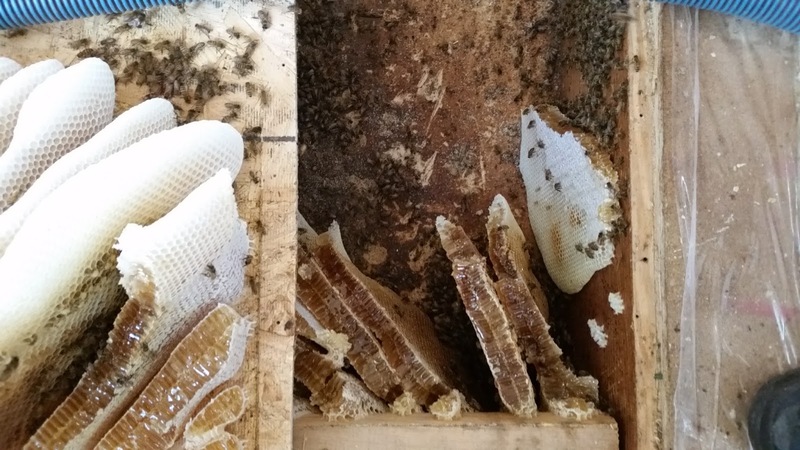 Once we had the bees and the mess they’d made out (it’s not a mess in a hive, but I wouldn’t want honey dripping onto my sheet-rock dining room ceiling), we secured the gaps with window screen. We then went outside, removed the fascia, and blocked the entrances from that direction. By that time, we could remove our suits in the room (it’s a toasty 90 degrees today), and continue clean up. Hubby secured a piece of plywood over the window screen and also added some vertical blocking, just in case. The bees had been exploring and ending up in the kitchen light fixture on the other side of the house before we were called in, so if they find another way in, we want them to be confined to a small area. As there’s no way for us to eliminate the home-sweet-hive smell from the joists, hubby filled the cavity with insulation and now has the floor put back together. I came home and got the bees situated in their temporary homes, and the day was a success! Of course, in the middle of all this, I just had to go to my car and get my coffee — after I’d unzipped my veil a little to cool off. So, yep, I ended up with a bee in the suit and a bee in the veil — all for some coffee that I then didn’t drink! The good thing is that I now know that Stops the Sting really works! I had to scrape the stinger out of my chin and then go find the Stops the Sting in my pocket book. Once I applied it, the pain stopped and there has only been minimal swelling. I can see the hole in the middle where the stinger was, so now I just look like a teenager with an acne problem. That was at least 5 hours ago, and it still doesn’t hurt. 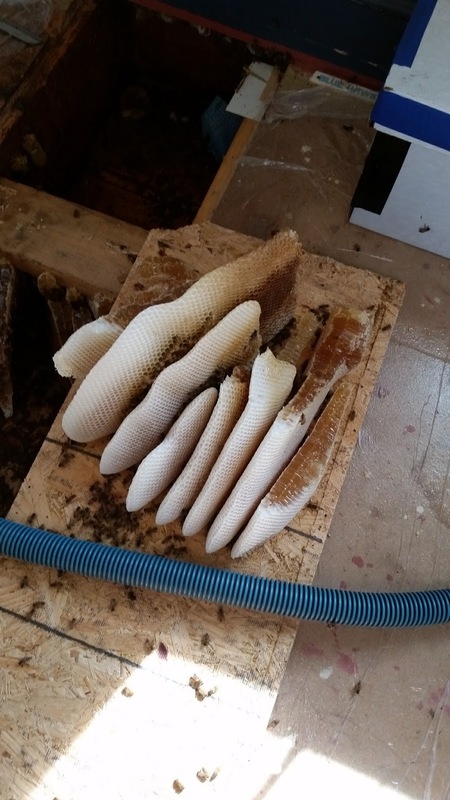 I just ordered two more tubes – one for each bee tool box. It’s been a rewarding, exciting, nerve-wracking, satisfying start to the holiday weekend. We’ll go back over to the house tomorrow and Monday just to make sure everything is okay and the foragers realize that their family moved and didn’t leave a forwarding address! All-in-all, I don’t regret staying in the city to do this. I’ll head down to the farm next weekend and see what the bees down there are up to. I’ll have to come back to the city periodically as the fig tree has gone insane, but more about that later!